According to Slavin, there are almost always a few schools ready to make a change and lead by example for the schools that are willing to follow. These schools are referred to as ‘seed schools.’ They are either built to show the change or adapted to make use of their current environment. One school in particular comes to mind at the thought of seed schools. The Greater Essex County District School Board (GECDSB) was fortunate enough to welcome, The Dr. David Suzuki School into its family. The designers of this school refer to it as a LEED school, which means, Leadership in Energy and Environmental Design. The school has reached platinum in ranking, which is the highest level attainable. They have implemented environmentally safe and efficient ways of using light, water, heat, air, irrigation, recycling, energy and maximizing surface space. An example of this would be their rain water harvesting initiative; rain water is collected on the roof of the school, then goes through a filtering process and is reused in the school. The school also uses solar cells, which capture natural light and turn it into energy. This EcoSchool is the perfect example of a seed school within our community. 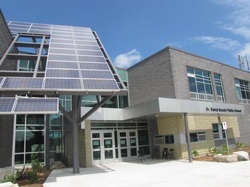 The school’s goal is, “to affect behavioural change among our staff and students in terms of energy conservation, waste minimization, school grounds greening, curriculum delivery and community involvement.” They have essentially built from the ground up in an effort to create the best learning environment possible for our youth. Dr. David Suzuki Public School. (2010). Dr. David Suzuki Public School. In undefined. Retrieved October 1, 2011, from http://www.suzukipublicschool.ca. Slavin, R. E. (2005). Sand, bricks, and seeds: School change strategies and readiness for reform. In D. Hopkins (Ed. ), The Practice and Theory of School Improvement (pp.265-279). Netherlands: Springer.